Academic research trends continue to drive transfection technology advancements. Researchers hope to use more biologically relevant yet hard-to-transfect cell models in addition to the standard immortalized cell lines, along with a broader range of nucleic acids, such as RNA variants. These possibilities lead to interesting twists that demand innovation. Efficiency and viability rates, process reproducibility, robustness and reliability, as well as scalability—all these considerations make transfection challenging. A single “best solution” currently does not exist; methodologies satisfy certain experimental parameters, and all come with advantages and disadvantages. A critical piece of the puzzle for producing new therapies for hard-to-treat diseases, transfection broadly segments into chemically mediated, non-chemically mediated, instrument-based, and viral-vector-based methods, according to Mark Bloomfield, CEO at Polyplus-transfection. Researchers’ interest in expanding the transfectable repertoire of cell lines and the range of nucleic acids used creates an ongoing need for optimized reagents for specific uses. In parallel, chemically mediated methods have evolved into a sophisticated range of compounds, encompassing lipid- and cationic-based polymer systems, with multiple variants in between. In addition to research, chemically mediated transfection is used in bioproduction, such as the manufacture of recombinant proteins, antibodies, and viruses, for basic research as well as drug discovery and development applications. The demand for therapeutic proteins as replacements for classical new drug compounds makes the need for additions to the transfection product pipeline even more urgent. Transient gene expression, when the transfected nucleic acid is not permanently incorporated into the cells’ DNA, is now used broadly in producing larger scales of therapeutic proteins, or new designs of proteins, for further evaluation and study. Bioproduction applications have sparked requirements for cost containment (via increased cell densities, more efficient transfection rates, higher cell viability, and lower DNA usage), a plethora of enhanced physical growth platforms (in the form of bioreactors and disposable cell culture systems), and a shift toward higher production standards (from research-grade to well-defined GMPs, or good manufacturing practices). In the vast majority of cases, hard-to-transfect cell lines express very little heparan sulfate proteoglycans on the cell surface (or none in the case of lymphocytes), making it difficult for transfection reagent/nucleic acid complexes to interact with the cell membrane and enter the cell by endocytosis. Primary cell researchers looking for therapeutic outcomes have pushed transfection reagent manufacturers, such as oligo-chemistry and delivery experts Polyplus-transfection, to develop more efficient, effective, and specialized transfection systems that are optimized for complex therapeutic nucleic acids, designed for systemic delivery in animal models and then in human clinical trials. Improvement of chemical- and lipid-based technologies over the last decade permits robust transfection in many commonly used cell lines. “However, as the complexities of biology are better understood, these cell lines have been found to not allow a complete picture of the biology of interest,” noted Kevin Kopish, strategic marketing manager, cellular analysis, at Promega. Cell models are migrating toward more physiologically relevant systems that are increasingly more difficult to transfect. These cell model changes have resulted in the broader use of electroporation and viral-delivery systems, which can often deliver genetic material effectively, but may come with downsides such as loss of viability, equipment costs, and complex (and often variable) virus preparations. Improved lipid and chemical transfection reagents that perform well in biologically interesting cell types are ongoing requirements. Many transfection systems cause gross over-expression of exogenous proteins that can overwhelm the cells and mask true biological responses. Promega recently developed an ultra-sensitive reporter, NanoLuc Luciferase, to tag proteins even when expressed at, or below, physiological levels. This sensitivity allows better performance in systems with lower transfection efficiency since the reporter can still provide a large, detectable signal. Cytotoxicity can be overcome through careful reagent selection and optimization. Typically, cationic liposomal reagents have high cellular toxicity; in contrast, newer polymeric formulations are gentler to cells without compromising gene-delivery efficiency. A better understanding of how cell biology differs across cell types, as well as better knowledge of receptor profiles, uptake processes, endosomal escape mechanisms, and key regulatory molecules for transfection, will allow the development of better transfection reagents, especially in cell types that defy current methods. Functional co-delivery of plasmid DNA and siRNA using Mirus Bio’s TransIT-X2™ dynamic delivery system: The system was used to transfect plasmid Cy™5-labeled DNA encoding nuclear YFP and Cy™3-labeled siRNA into HeLa cells. Transfection was performed in a six-well plate with Poly-L-Lysine (PLL) coated coverslips using 4 µL of TransIT-X2 to deliver 2 µg of DNA (2:1 reagent:DNA ratio) and 25 nM siRNA. 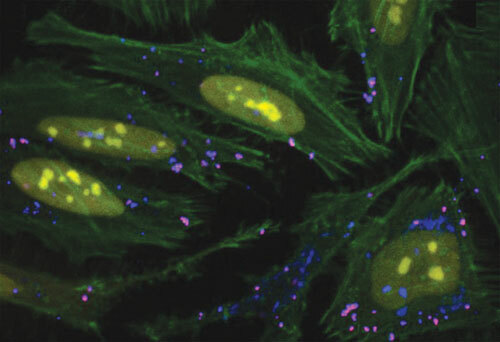 Actin cytoskeleton was stained using Alexa Fluor® 350 Phalloidin. 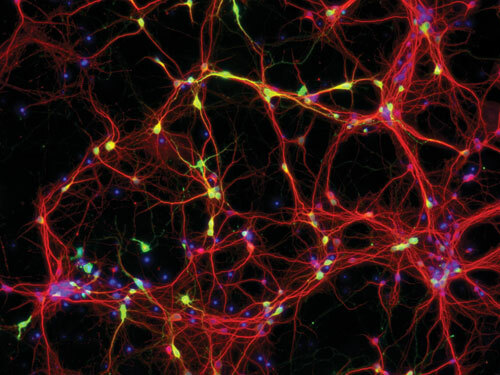 Image (63X) was captured at 24 hours post-transfection using a Nikon A1R confocal microscope. Merged image key: yellow (nuclear YFP), blue (Cy5-labeled DNA), red (Cy3-labeled siRNA), green (actin cytoskeleton). “The goal is to achieve high efficiency while minimizing off-target and cytotoxic effects. If the cellular gene expression is altered by the transfection reagent itself, off-target effects, instead of physiologic effects, are measured,” said Manfred Watzele, director R&D, technology & innovation group, at Roche Applied Science. Traditional transfection reagents were developed as one-component formulations, consisting of either polyamines, such as polyethylenimine, or a liposomic formulation containing a cationic lipid with or without a neutral lipid mixed into it. The simple polyamines, albeit relatively inexpensive with reasonable transfection rates, cannot easily be metabolized or excreted and therefore cause substantial stress, ending in cytotoxic behavior. 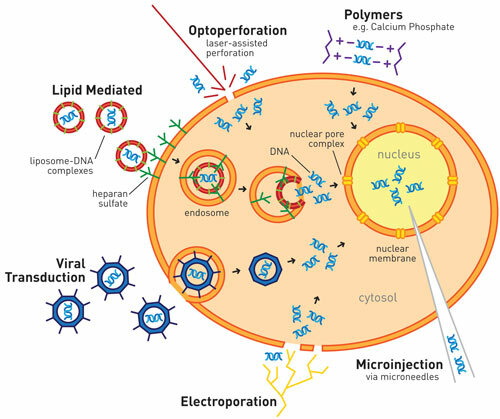 Conventional liposomic formulations are often observed to transfer nucleic acids efficiently into the cell, but fail in many cases to release the nucleic acid from the endocytic vesicles or to efficiently transport DNA into the nucleus. Multicomponent systems, such as the Roche Applied Science X-tremeGENE transfection reagents, seek to address efficiency and cytotoxicity. Components that neutralize negatively charged nucleic acids are mixed with components that facilitate plasma membrane penetration. After entry, the membrane-penetrating components dissociate from the complex; other components remain complexed to the DNA and target the transfected nucleic acid into the nucleus. “Over the next 5 to 10 years, transfection technology will continue to adapt to the evolving needs of cell biologists. For those involved in proteomic work, improvement of protein yield will likely drive the development of new technologies,” added Lauren Buck, associate marketing manager at Roche Applied Science. 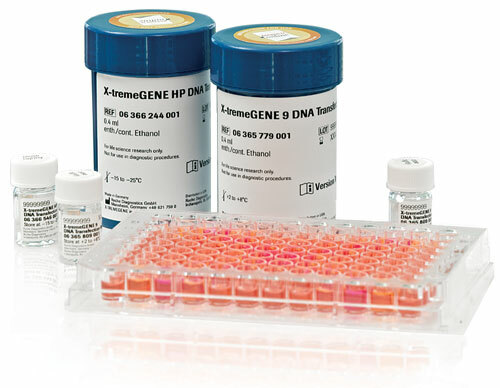 The Roche Applied Science X-tremeGENE transfection reagents contain components that neutralize negatively charged nucleic acids mixed with components that facilitate plasma membrane penetration. The majority of today’s biotherapeutic proteins are produced in CHO cell lines adapted to suspension growth in chemically defined media formulations. Transfecting cells that are cultured under these conditions introduces new hurdles. While commercial production of biopharmaceuticals uses consistently productive cell lines that take many weeks to develop, the production of material from transient gene expression systems can be performed early within the drug development pipeline to generate milligram to gram amounts of representative therapeutic material for early preclinical and biochemical characterization studies. The challenge is optimizing reagents and processes for the 1–10 L (or larger) scale. In the past few years, there has been a significant increase in the number of commercially available reagents and protocols that can be used for larger-scale transient transfection of suspension cell lines cultured under chemically defined media conditions. Tempering the use of these reagents to date is the relative high cost at this scale and the need for reagent removal from the resulting biostream. Cell culture growth conditions and harvesting times for optimal production are not yet standardized protocols. Transfection efficiencies can vary significantly with the scale, cell line, expression vector or plasmid, purity of pDNA, and media. The age-old transfection pitfalls remain. Cells die after they are transfected, or cells remain healthy only because they are not transfected. “Increasing the transfection efficiency will simplify and clarify experimental answers. For example, if you have a population of cells that are only 50% affected, it can be difficult to determine the true response to treatment,” said Steve Kulisch, cell biology business unit manager at Bio-Rad. The desire to get more efficient delivery of biomolecules forces innovation. With the vast number of cells researchers use today, the Holy Grail is to find some technology or technique that is efficacious for all cell lines with minimal amounts of optimization. Cellular variations include: varying lipid compositions in the plasma membranes and different cell sizes with ranging amounts of exposed surface areas. Adherent versus suspension cultures affect surface area as well. Getting the material into the cell is step one. Step two is getting that biomolecule imported to where it needs to be; some cells are more efficient at biomolecule transport than others. Bio-Rad pioneered electroporation as a transfection methodology and also offers biolistic devices. These devices coat small gold or tungsten microparticles with nucleic acids or proteins, then use a helium blast to accelerate the microparticles into the sample. Although the company’s technologies have not changed dramatically since their introduction, a recently introduced electroporation buffer assists with opening up the pores on the cells and also provides energy to help with recovery, improving electroporation transfection efficiency. Many basic research questions are still first addressed by transfecting easy-to-access and easy-to-culture, but also artificially immortalized or cancer-derived, cell lines. To confirm that insights gained from these “artificial” cell line systems reflect the in vivo situation, there is a need to switch to more biologically relevant models. For therapeutic approaches, the use of primary animal cells could reduce the number of animal tests, and use of primary human cells allows extrapolating findings from such animal models. “The challenge for transfection of biologically relevant cells, such as primary and stem cells, is to find an easy-to-use method that achieves reproducible high transfection efficiencies without major impacts on viability and functionality,” explained Andrea Toell, Ph.D., senior product manager at Lonza Pharma & Biotech-Bioscience Solutions. A technique that holds promise, viral transduction typically achieves high efficiencies in primary cells and allows for stable integration. But working with viruses is laborious. Some viruses may also have an influence on functionality due to their stable integration and induction of interferon responses. Lonza’s electroporation-based Nucleofector Technology is a nonviral technology. It achieves transfection efficiencies close to virus transduction for hard-to-transfect cells, according to a company official, who added that compared to classical electroporation, the technology achieves much higher viabilities for primary cells and higher efficiencies with smaller amounts of DNA. Transfection reagents require cell proliferation for transferring the DNA into the nucleus for expression, while the Lonza technology allows transfection of nondividing cells, such as unstimulated T cells or neurons, as the DNA is directly transferred to the nucleus. Another key aspect of transient transfection innovation is the ability to simply and cost-effectively scale transfections without sacrificing performance or primary cell compatibility. “As more biologically relevant cell systems are developed, such as primary cells, researchers want to adopt these within biotherapeutic and drug development activities,” said Karen A. Donato, Ph.D., executive vp, global business development and marketing, at MaxCyte. MaxCyte flow electroporation was originally developed for ex vivo cell transfection, which requires reliable, high-efficiency transfection of primary cells (such as human embryonic or adult stem cells, human T cells, or dendritic cells) in large numbers with rigorous safety standards. Flow electroporation melds the benefits of electroporation with simple scalability, which is advantageous in the fields of small-molecule and therapeutic protein development, explained Dr. Donato. The MaxCyte electroporation system performs transfections of 5 × 105 cells in seconds to 2 × 1011 cells in less than 30 minutes, she continued, adding that the scalable approach results in high viability and high efficiency, which in turn leads to high expression of the protein of interest. “Speed, reliability, and reproducibility are all going to become increasingly important. Pharmaceutical companies are looking for technologies that can help them make better decisions up front in the development process with fewer resources, in less time. Transient transfection is becoming a significant part of the drug development toolkit,” concluded Dr. Donato. An exciting transfection milestone is development of RNAi transfection tools for use in research applications as well as for the delivery of new biologics as therapeutic modalities. Previously, there were no tools to deliver RNAi in vivo. Invivofectamine 2.0, a lipid-based RNA transfection system that protects the nucleic acid from degradation in the bloodstream, allows researchers to deliver RNAi to small animal models, such as mice and rats, and to directly perform functional and biologic analysis. In vivo transfection technology opens the door to rapid design and production of knockout animals facilitating genomic and proteomic research. “Transfection technology development will continue. In addition to primary, stem cells and in vivo applications, efforts also need to focus on plant and algae cells. These systems have yet to be optimized,” added Dr. de Mollerat du Jeu. According to Louise Baskin, senior product manager, Thermo Fisher Scientific, the primary applications for transfection have not changed dramatically in the past few years. Gene and protein expression studies, RNAi, and protein production remain the key applications utilizing transfection. Achieving a balance of efficient transfection with low toxicity is the universal challenge, maintains Baskin. “Researchers would love a ‘silver bullet,’ a single delivery technology that would transfect into any and all cell types with low cell death,” she continued. Baskin believes that transfection technologies to support stem cell research remains an under-served part of the life science research market. The low tolerance for cellular disruption and low overall transfection efficiency by most existing techniques remains a challenge. Derek Levison, Ph.D., managing director of emp Biotech, stressed that rapid, cost-effective, large-scale transient transfection for the production of huge amounts of affordable recombinant proteins is still an elusive goal. Currently, transient transfection requires special cell culture media and rather large amounts of both DNA and transfection reagent, he explained, adding that it is unavoidably necessary to exchange culture medium prior to transfection when transfecting with polymers. For batches of small to medium size, this procedure is easy to handle, but for larger scales it is next to impossible, according to Dr. Levison. The most appealing applications of transfection will be gene therapy and personalized medicine, pointed out Dr. Levision.